François Boucher brings capitalism to art history. Venus at Vulcan’s Forge was one of six works painted for an hôtel in Paris. An hôtel is an urban mansion, not a Motel 6 hotel, though now it’s a school (French Revolution etc.) but you can still see the fancy carriage doors at 3 rue Béranger. Anyway, Boucher was strictly about pleasure. Ostensibly the scene is about Venus shopping for weapons for her not-god son Aeneas to use against the Trojans, but look at this painting, it’s dripping with millennial pink and hot almost-nudes and seems entirely unconcerned with war and any other unpleasant things. 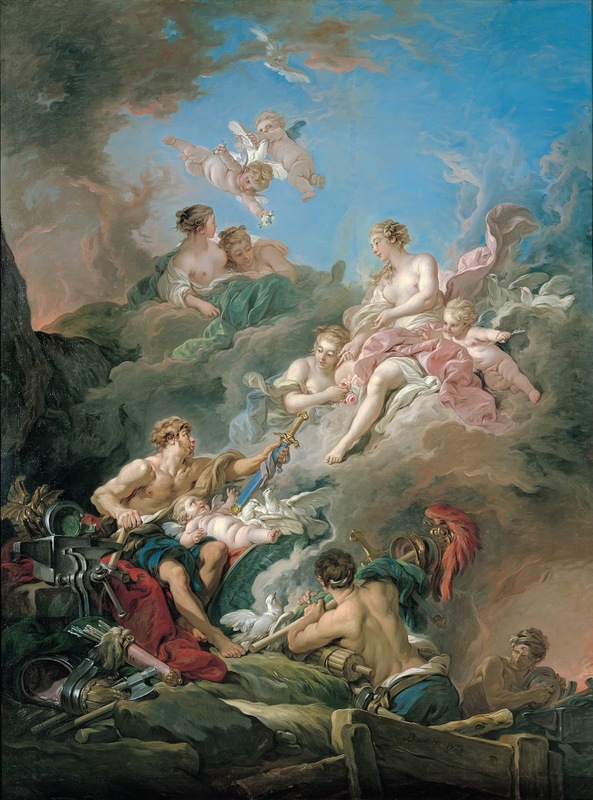 That baby in Vulcan’s lap means that Venus is in full control (mhm yeah she is), he’s handing his sword (“sword”) over to her like a rose but she’s more interested chilling in clouds with her girls. If you didn’t know the mythological reference you’d probably think this was some soft-erotica cosplay fanart. Boucher was criticized in the 1760s for his “attachment to a purely fictive universe.” Democratic sentiments were heading towards revolution in America and France, the public was becoming aware of its terrible poverty, and Boucher kept stubbornly painting pretty things for rich people. But his brand of Rococo seems like it’s about to have a resurgence—living in a “fictive universe” and an obsession with drowning all the noise of ennui with pink clothes and soft skin is basically what we’re all about these days.